Rick of Firewood - How Much Is That? A rick of firewood is a firewood measurement used to describe a quantity of wood. Unlike a cord of firewood which is 128 cubic feet, a rick or face cord is not a consistent measurement, so it can vary from place to place. The biggest problem with a buying a rick of wood is the fact that you don't know exactly how much wood you are getting. The length of the logs dictate how much wood you get. Generally speaking if the logs are cut 16 inches long and are stacked 4 feet high by 8 feet long, a rick will be 1/3 of a cord. If these same logs were cut 24 inches long, the rick would equal 1/2 cord. So the length of the logs directly impact the amount of wood you get. How much are you actually getting? The only way to really know is to measure the stack of wood and the lengths of the logs. As a general rule, most wood suppliers cut wood 16 inches long. With that being said, a typical rick or face cord of firewood is 1/3 of a cord. Since most homeowners who burn wood heat their house with a fireplace or wood stove, most stoves accommodate wood up to 16 inches. Wood that is cut to 24 inches is pretty long and could cause problems with some of the smaller stoves which is why it's not as common. As mentioned earlier, the only way to know how much wood you are getting is to measure it. Many people have been ripped off because they don't understand what they are buying. It's not uncommon to find firewood for sale that's already loaded in the back of a pickup truck. The amount of wood that's contained in the bed of a pickup truck can vary. Is it a standard size bed or short bed pickup? How tight is the wood stacked? How tall is the wood stacked? Is the wood split or is it still in rounds? All of these factors change how much wood you're actually getting which is why it's easiest to see the wood properly stacked so you can measure it. To make things even more complicated, a rick of firewood or face cord can vary drastically from state to state or even from each supplier. Because there is no official measurement, take the time to measure it yourself to see exactly how many cubic feet of firewood you're buying. Okay, so we've determined the only consistent way to buy and sell firewood is by the cord which is 128 cubic feet. So how do you know how much that is? 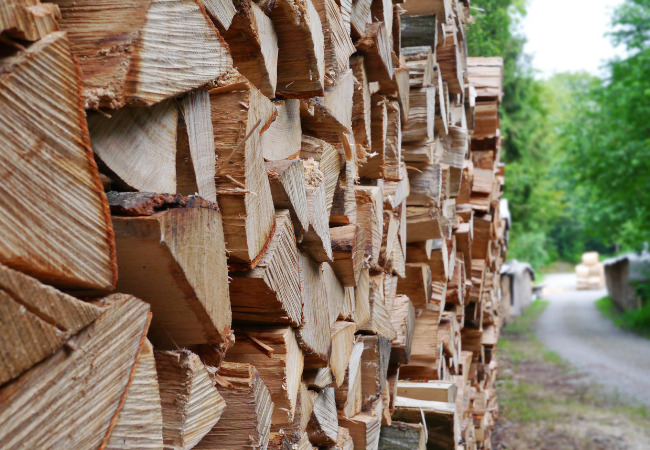 Try using our free firewood cord calculator. It's really easy to use. Simply plug in the dimensions of the firewood stack and the calculator will show you how many cords of firewood you have! As with any firewood you buy, make sure it is quality hardwood or softwood that has been properly seasoned. Unless you intentionally buy green firewood, the wood you receive should be dry and ready to burn. The wood should look grey and have splits on the ends. Well seasoned wood takes about 6-12 months depending on the species, so if the firewood delivered looks like it was cut down yesterday, chances are it's not ready to burn. If you do buy green firewood it should come at a discounted price since the wood will require several months of seasoning before you can burn it. As a general rule hardwoods will require longer to season since they are more dense and softwoods dry out a little bit quicker. To speed the drying process up even more, split the wood as soon as possible to expose the maximum amount of surface area to the sun and wind which will help dry out the wood faster. Elevating the wood off the ground by using pallets or 2x4's as runners will prevent your firewood from soaking up ground moisture and it will allow the wind to flow under the firewood allowing it to dry. A firewood shed with a roof is a great way to prevent rain and snow from getting on your firewood, but if you don't have a shed you can simply cover your firewood with a tarp. If you're going to use a tarp, don't cover the entire stack of wood. This prevents to wind and sun from drying out the wood and you can actually cause mold to grow on the firewood. Instead, only cover the top 1/3 of the stack. This helps shed the rain and snow while still allowing the wind and sun to help dry the wood. In the end, buying a rick of firewood or face cord is very common. 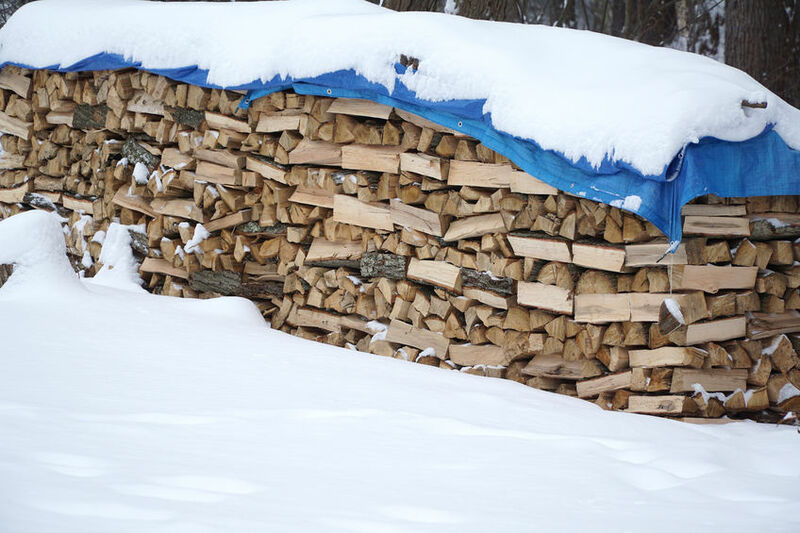 Knowing what to look for in terms of firewood length and how it is stacked will take all the guess work out of buying the wood and you'll feel more confident knowing you're getting what you paid for.